The usual crew of red-eyed zombies did not shamble, mumbling about branes, into the desert this morning, no, as no-one needed to qualify. Instead we got an extra couple of hours in bed. Which was nice. Runs instead got under way at the civilised hour of 08:45. Rob set the tone for the entire morning. First a bead of sweat dripped into his eye as he waited to launch. There's just enough room inside the Kyle Edge to allow him to wipe his eye, but in doing so he managed to switch off his backup monitor. So when he got going, the first thing he did was stop - the bike has a "landing wheel" on its right side - and switch it back on. When he reached the catch area, the lack of depth perception which results from the use of the video system saw him overshoot the waiting hordes and topple over onto his side twenty yards closer to town. 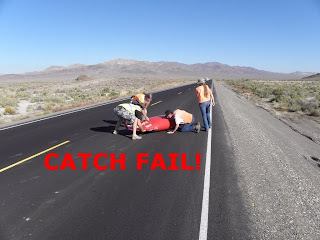 And Larry had a launch malfunction, though not as bad as the one on Wednesday, when he appeared to be at risk of becoming the first five-wheeled machine to run on 305 when the MOALD1 remained attached as he accelerated away. Kevin Schroeder narrowly failed to reach his 55 mph target, and sorely was he vexed. Although the wind was benign further down the course, it was tricksy near the start, and Jay decided he didn't like it one little bit, pottering down the road at around 20. This obliged a puzzled Bobby Ehrmann to overtake before Jay's chase crew could pull him off the road. In the second session Larry got away successfully and hit a solo personal best of just over 62 mph; Tiffany got stalled by an errant gust of wind and was well off her usual pace. In the afternoon Robert "Mr" Barnett of Oklahoma ran the one-eighth miles drag races in town, while your scribe slaved over the Babbage-Engine for hours with but a brief pause here and there for beer. Anyway, it will shortly be time to go to the course again, and should Timing Guru Craig Johnsen's weather forecast prove correct, tonight may be the last time conditions are good for records, as tomorrow there may be Wind chiz. Ahoy! I am returned from 305 and El Aguila Real, and am still tasting the chorizo from the latter. Tonight was one of those evenings which makes all the time and expense worthwhile. Three notable personal bests and three, yep, three new World Records! 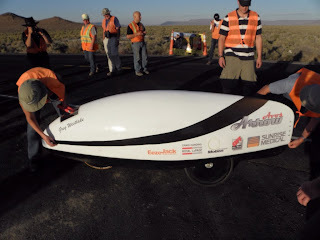 Team Leone tidied up the tail of Primal 2's fairing, which helped Ron to exceed 65 mph for the first time, at 66.60 mph. Eric just pushed harder, and got a 71.07 mph pass and one of the biggest cheers of the week. And Yannick Lutz was much happier today with his 73.07 mph. Greg did it again! 43.49 mph for his fourth record in three days. Georgi Georgiev has been churning out record-breaking designs since forever, so big rispek to Mike Sova and Ivan Samila for adding nearly eleven mph to the old record with their very first design. Sam improved on his run from Tuesday with an 82.82 mph pass. And Barbara, in spite of Sam's shameless hogging of the smaller of the two machines, put in a storming 75.46 mph run, which not only makes her the fourth fastest rider in the history of all things evvah, but also gives her the outright European record. $DEITY alone knows how she manages it, as there isn't very much of her to generate all that oomph. Oh, the drag races. 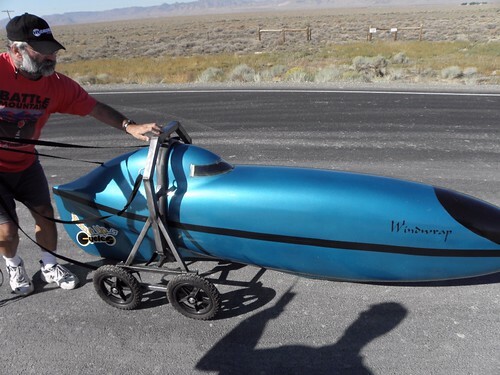 Scott Wilson trousered fifty of Mr. Barnett's dollars after using Carl Mueller's Greenspeed trike to beat Barbara's partner Julius into second, with Mr. Barnett himself third. Thought for the day: The eighteen-odd minute gap in the Watergate tapes is as near as makes no odds the same length as Arlo Guthrie's Alice's Restaurant. Coincidence, or Tricky Dicky trying to conceal something? The latter would certainly not be a surprise. 1 - Mother of all Launch Dollies.